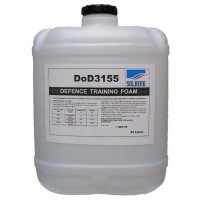 Solberg DoD 3155 is an economical training foam product for cold and hot training exercises. The product is a superconcentrate that must be diluted by adding 1 litre to 19 litres of water, then proportionate the mixture at 6% through air-aspirated or non air-aspirated equipment. The resulting foam can be used for cold training exercises to allow crews to become familiar with their equipment and have minimal environmental impact. In addition, the foam can be used for hot training exercises on hydrocarbon, non-water miscible fuels.